Michael Wamalwa, who has died of a heart attack aged 58, was a charismatic, flamboyant and unashamedly anglophile Kenyan politician who became his country's vice-president after the National Rainbow Coalition swept to power in last December's general election, ending President Daniel Arap Moi's 24 years in power. Well known for his love of Shakespeare, classical music, Savile Row suits and sports cars, he was nicknamed Kijana (meaning a young person in Kiswahili) because when he tried to become a member of parliament at the age of 30, he was considered too young. He was one of the group of young politicians who made up the Forum for the Restoration of Democracy (Ford), a movement geared towards restoring multi-party democracy to <?xml:namespace prefix = st1 ns = "urn:schemas-microsoft-com:office:smarttags" />Kenya. Born in Sosio, a village in the western province, Wamalwa was the son of the influential senator, William Wamalwa. He became head boy and the best debater at his secondary school, won a national essay competition and represented Kenya at a UN student forum. In 1965, he was awarded a commonwealth scholarship to study law at King's College, Univesity of Cambridge, graduating in 1968 before going on to the London School of Economics. He was called to the bar at London's Lincoln's Inn in 1970. That same year, he returned to Kenya to teach in the law faculty of Nairobi University. Simultaneously, he ran his family farming business and held several high-profile positions, including general manager of the Kenya Stone Mining Company and director of the Kenya-Japan Association. Wamalwa's first foray into politics came in the 1974 parliamentary election, which he lost largely as a result of his youth and the media portrayal of his elitist background. His campaign was noted for its ostentatious display, which included the use of an aircraft. He finally won a seat in 1979, and was subsequently re-elected twice. In the early 1990s, he became a household name in Kenya as the parliamentary opposition leader heading the clamour for democratic reform. 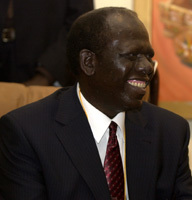 With the country's once-vibrant economy in decline, international pressure forced Moi to allow a multi-party election, though, in 1997, Wamalwa's presidential bid failed - largely because of divisions within the opposition - and Moi was able to claim victory, albeit as a weakened president. In the run-up to the 2002 elections, having realised that it would take a stronger opposition to unseat Moi's party, the Kenya African National Union (Kanu), Wamalwa formed a political alliance with Mwai Kibaki (the current president) and some disgruntled members of Moi's government. The National Rainbow Coalition seized the momentum, winning a landslide victory and defeating Moi's candidate, Uhuru Kenyatta, himself the son of Kenya's first president. In the wake of the electoral triumph, Wamalwa was appointed vice-president. Earlier this year, however, he was taken ill and treated in London. He briefly recovered, returning home to marry his longtime partner, Yvonne Nambia, in a sumptuous ceremony; he proposed in Shakespearean English, and arrived at church in a vintage Ford, wearing a morning coat. Wamalwa was a witty and eloquent parliamentarian, known for his Churchill and Kennedy quotes. He died days after representing Kenya at an International Labour Organisation summit in Geneva, and had been widely tipped to become his country's next president in 2007. Michael Kijana Wamalwa, politician, born November 25 1944; died August 23 2003.